he phone call came in on a Friday, a day on which men in Mike McCarthy's position -- getting ready to coach a championship game, with one victory standing between him and a spot on football's grandest stage -- typically tune out the noise, be it a legion of talking heads forecasting defeat or a ubiquitous smartphone ringtone. McCarthy took this call, though, because it was from his only brother, who'd been contemplating a cross-country trip to watch the Green Bay Packers battle the Seattle Seahawks for the NFC championship two days later. "Don't worry about the tickets," Mike, the Packers' coach since 2006, had assured Joe McCarthy, a Pittsburgh-area lawyer. "I've got you covered there." Replied Joe: "I can't get a flight. I mean, there's nothing ..." Then, jokingly, he asked, "Hey, if I can get to Green Bay, can you get me a seat on the team plane?" Mike laughed. "You know what, Joe? Don't sweat it. Just get ready for the Super Bowl. 'Cause we're going -- and you're going." And then, swiftly and shockingly, it all went terribly wrong. osing a conference title game, especially in a fashion as cruel and unusual as the Packers experienced on that surreal Sunday at CenturyLink Field last January, is a gut-wrenching event. This is particularly true for the person charged with plotting the preparation and making the bulk of the strategic decisions on game day. And Green Bay's 28-22 overtime defeat to the Seahawks -- after one of the most inglorious collapses in NFL history -- left McCarthy, 51, in a state of stunned bewilderment. One of the few things that momentarily cheered him up in the immediate aftermath was a brief, heartfelt message from his brother. "First guy to text me after the game," Mike recalled last month. "That's the kind of guy he is. Nothing about the game, just, 'Can't wait to see you, can't wait to hear what the kids have to say to you, [they're gonna] tackle you when you get home ...' All about life and family; didn't even mention the game." Yet if there was value in distancing himself from the torment of watching the Packers, who'd dominated the game's first 56 minutes, blow a 12-point lead in the final four minutes of regulation, McCarthy didn't embrace it. Instead, he opened his laptop and cued up the game film on the team's subdued flight back to Green Bay that Sunday night, then spent the next two days conducting emotional exit interviews with each player on the roster. By Wednesday morning, McCarthy was drained and exhausted. As he sat in his Lambeau Field office with Packers director of public relations Jason Wahlers, preparing for a season-ending press conference scheduled to begin less than an hour later, he took another phone call -- this time from his father, Joseph Sr., who delivered jolting and tragic news: Joe McCarthy, a married father of three, had gone to the gym, collapsed and died at age 47. 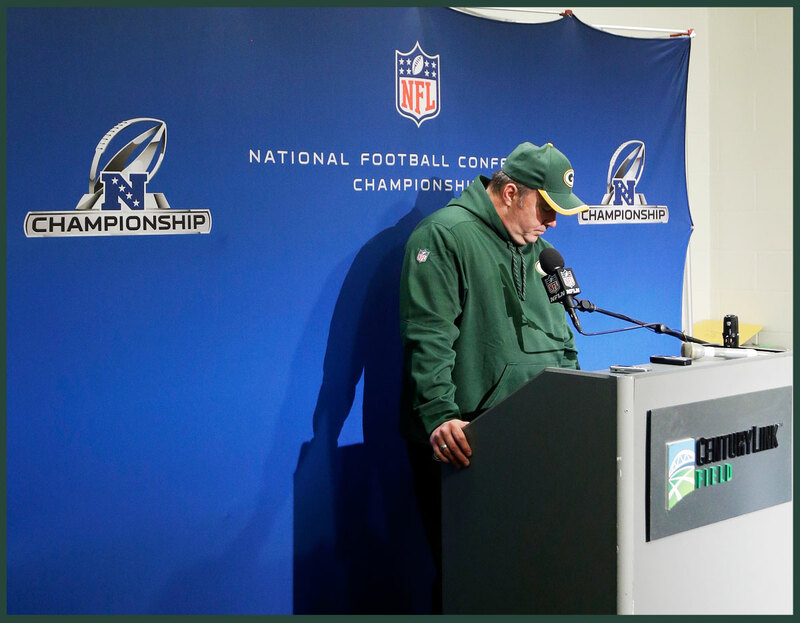 Mike McCarthy caught a lot of flak following a crushing NFC Championship Game loss in Seattle. Suddenly, losing a football game was a tangential sorrow for a grief-stricken big brother and his large, close-knit family. Needless to say, the press conference was postponed. 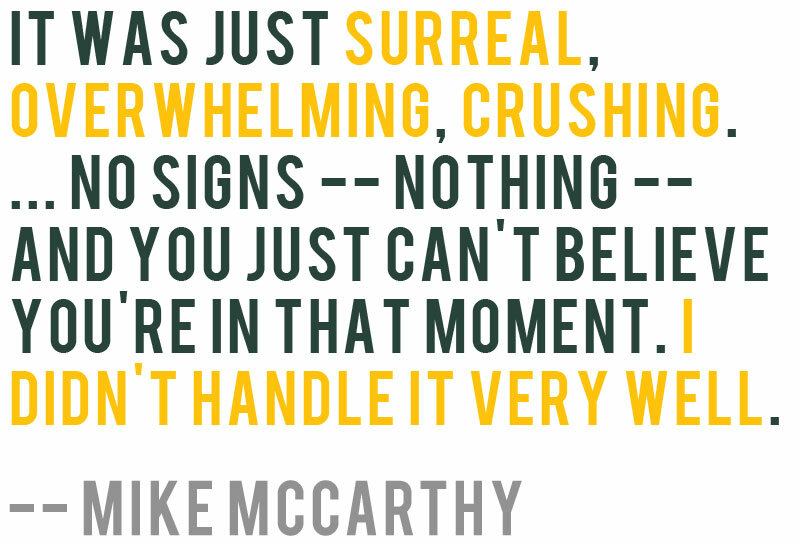 "It was just surreal, overwhelming, crushing ..." Mike McCarthy said. "No signs -- nothing -- and you just can't believe you're in that moment. I didn't handle it very well." Change has been a constant theme since McCarthy yanked off his headset in Seattle last January: Shortly after delivering an emotional eulogy at Joe's funeral in Cranberry Township, Pennsylvania -- a suburb of Pittsburgh, where he and his four siblings were raised -- McCarthy put aside his personal pain and contemplated a dramatic move that he felt could invigorate his team, even though it would force him to give up something he loved. And when, on Feb. 12, McCarthy announced he would no longer call the Packers' offensive plays, it made a significant statement to those who know him best. "It says that he cares about the team more than he cares about his ego or the perception of what this change is," said quarterback Aaron Rodgers, the NFL's reigning Most Valuable Player. "It says a lot about him. He's not a big rah-rah guy; he's not out in the media trying to get a ton of attention. He just cares about winning. And that's how we do things in Green Bay." f McCarthy is intending to send a visual reminder of the transformation he has spearheaded in Titletown, no one can accuse him of being subtle. In addition to changing his role and overhauling the responsibilities of numerous assistants, McCarthy spent the offseason growing a bushy beard that would make him look right at home in a Mumford & Sons video. "I'm looking for an edge on the sidelines, come winter," McCarthy joked on a misty Monday morning in June as he sat on a folding chair outside the clubhouse of The Legend at Bergamont, the Madison-area club where he and Jessica host their annual golf tournament. It was a rare moment of levity in an otherwise heavy interaction. During much of our hour-long conversation before his foursome teed off, McCarthy touched on emotionally charged topics, from his and Jessica's attachment to the Madison-based American Family Children's Hospital (the recipient of the event's proceeds) to his memories of Joe, a lawyer he described as a "super, wicked-intelligent man." He also fielded questions about the January debacle in Seattle, a sequel to the infamous "Fail Mary" of 2012 and a missed opportunity that, in its pivotal moments, constituted more of an Epic Fail. Until those final minutes, Green Bay had played a gritty, poised and comprehensively impressive game against the defending Super Bowl champion Seahawks, a team that had christened the 2014 season by smacking the Pack around in the same stadium. Even with Rodgers severely hobbled by a painful calf injury, the Packers were the aggressors, and their much-maligned defense had completely shut down the Seattle attack. With five minutes remaining, it was 19-7, with the Seahawks' sole score having come off a fake field goal, and quarterback Russell Wilson had just thrown his fourth interception. Many of the normally voluble fans at CenturyLink sat in stunned silence, mimicking the mindset of much of the football-watching nation. McCarthy, however, had seen it all coming. "The whole second half of the season, it was building and you could feel it and everything was coming together," McCarthy said. "And just the whole [NFC championship] week -- everybody was picking against us, 'cause I don't think a lot of people felt we had a chance to win that game, which was mind-boggling to me. I was just telling the guys, 'Just trust the film, trust your preparation.' We practiced at a high school field Saturday afternoon, a little city stadium right there in Seattle -- cool spot, all cement, lightly raining, just like the game -- and we went out there and had a really crisp hour-long practice. When we walked off the practice field Saturday, we were extremely confident. And it's unfortunate, because we put ourselves in position to win that game." Instead of facing the New England Patriots (a team they'd defeated in November for the chance to capture a second Lombardi Trophy in five seasons, McCarthy and the Packers headed home to ponder where it had all broken down. At some point, McCarthy pulled out the yellow legal pad he keeps by his desk and started searching for answers. "I'm a little bit of the old school," McCarthy explained. "When I worked [as an offensive coordinator] in New Orleans, I worked with [fellow assistant] Rick Venturi, and he had been around forever -- had seen it all, twice. He always used to say, 'Don't get too far from the yellow pad,' and that's something I've always appreciated. 'Cause in this era of computer coaching, it's really easy to get away from the nuts and bolts of it. I keep a yellow pad on the right side of my desk, and I write things down as they happen during the course of the year. Because after each year, I think it's very important to try to obviously improve, and being honest about improving everything. And I start with myself. Giving up the play-calling is something I've thought about for a couple of years, and I've probably only shared it with only one or two, maybe three people. And Aaron's one of them." Last January, I likened McCarthy and Rodgers to Spinal Tap's two visionaries, David St. Hubbins and Nigel Tufnel, detailing the passionate but healthy push and pull between the two men most invested in the Pack's prolific attack. That Rodgers was in the loop regarding the possibility that McCarthy might hand off his most cherished game-day responsibility to longtime assistant (and newly promoted "associate head coach/offense") Tom Clements is a testament to the quarterback's standing within the organization, and to McCarthy's faith in the partnership. Yet even Rodgers was caught off guard by the timing of the announcement, which McCarthy conceded was "kinda awkward ... because of the loss to Seattle, and obviously with my brother passing." And as much as McCarthy insists that the move was not a knee-jerk reaction to the NFC Championship Game, it's easy to see why some people got that impression. In retrospect, Green Bay can be faulted for a lack of killer instinct, as well as mental breakdowns by coaches and players on some pivotal plays. There was the decision by since-fired special teams coordinator Shawn Slocum to call an aggressive rush on Seattle's third-quarter field goal attempt, despite Green Bay holding a 16-0 lead, which left the Packers susceptible to the fake. There was since-released tight end Brandon Bostick's calamitous decision to try to field a late onside kick, even though his job was to block for star receiver Jordy Nelson, who was in position to catch it cleanly. And there was safety Ha-Ha Clinton-Dix's passive approach on Wilson's up-for-grabs, across-the-body throw on a two-point conversion that Luke Willson hauled in to give Seattle a three-point advantage in the final minutes of regulation. The decision by McCarthy to delegate the play-calling to Clements, thus freeing himself up to devote more focus to other areas, seems like a logical response to what happened in Seattle. "I think that Mike wanted to have a closer relationship to the other parts of the team ... which I think can really help us in the long run," Rodgers said last month in South Lake Tahoe, Nevada, where he was preparing to play in the American Century Celebrity Golf Championship. "And you've seen that in this offseason. We've definitely made some changes that have Mike McCarthy's stamp on them." For example, McCarthy has immersed himself in improving the Pack's special teams, joining newly promoted special teams coordinator Ron Zook -- another coach with whom McCarthy worked in New Orleans, and a former college head coach at Florida and Illinois -- in the professional equivalent of a six-month cleanse. After a very difficult start to 2015, McCarthy (center) took on a new look and a new approach. "Special teams has always been fun to me," McCarthy said. "It was always on a limited basis. Now, I'm in there full-time. Ron and I went through every page with [assistant special teams coach] Jason Simmons, redid the whole playbook. That's been fun." Similarly, McCarthy looks forward to providing an "offensive perspective, not only on how to play, but how to train" to the defensive side of the ball, where Dom Capers returns for his seventh season as coordinator. 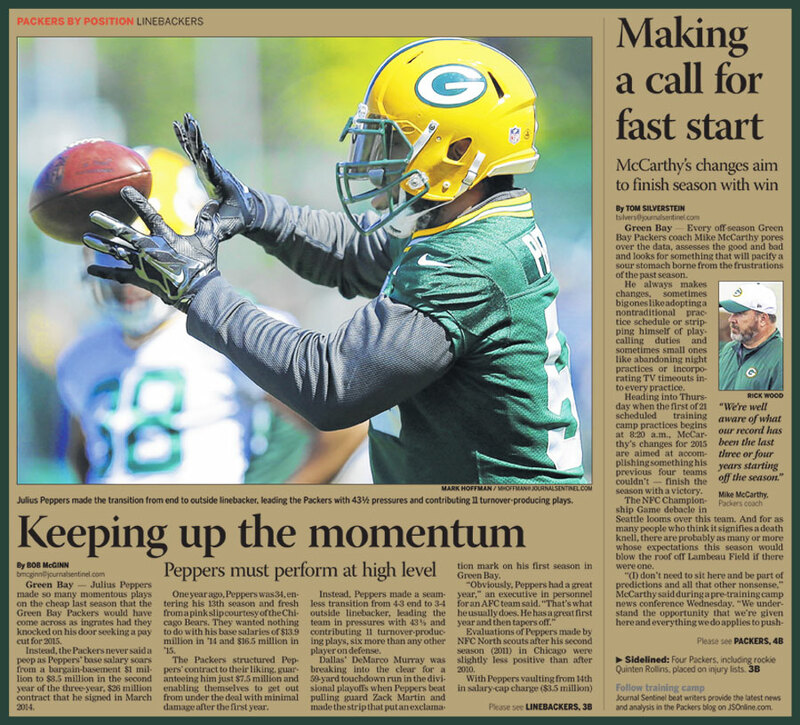 Most of all, in his preferred area of concentration, McCarthy saw an opportunity to shake things up -- and, he hopes, draw attention to the contributions of some of the men on his staff. Not only did the head coach promote Clements, whose tenure in Green Bay coincides with those of McCarthy and Rodgers, but he also expanded the roles of Edgar Bennett (who moves from receivers coach to offensive coordinator, inheriting Clements' former title) and Alex Van Pelt (who'll now double as quarterbacks and receivers coach). "We've been together for quite some time," Bennett said. "That part won't change. It's just different responsibilities for different people. But Mike is still involved in all of that." Whereas some head coaches do everything in their power to keep assistants from leaving, McCarthy -- like former Packers coach Mike Holmgren, and Holmgren's Hall of Fame mentor, Bill Walsh -- actively endeavors to expand his coaching tree. Though his former offensive coordinator, Joe Philbin, got the Miami Dolphins' head-coaching job following the 2011 season, and ex-Green Bay quarterbacks coach Ben McAdoo was hired as the New York Giants' offensive coordinator two years later, McCarthy has privately bristled when assistants like Clements and Bennett haven't even been considered for other openings. "I don't get that," McCarthy said, his voice rising. "I mean, am I doing something wrong? We've got some great coaches on this staff. I just don't get it." Said Bennett: "He's commented on [assistants not getting looked at for other jobs] recently, to us. Now he's giving us an opportunity to continue to grow and develop, and you've got to give him credit. It kind of says something about the man. X's and O's, that's one thing, but the more important thing is the bond that we build. Guys on this staff genuinely care about him, not only as a coach but as a man. It's like an extended family." amily is not something McCarthy takes for granted. He and Jessica each have children from previous marriages, and their decision six years ago to devote their charitable energies to the American Family Children's Hospital was hardly coincidental. "We were looking to do something as a family, obviously being newly married and having young kids," Mike McCarthy said. "We felt like we wanted to give back, and obviously children was the focus. And once we saw how remarkable the facility was, how it's geared toward families, we knew this was right for us." The night before the golf tournament, after a silent auction and dinner in a banquet room just off the shore of Lake Monona, McCarthy proudly introduced his family to a large gathering of supporters and contributors: His 23-year-old daughter Alex, who graduated from Kansas and is now exploring writing and acting opportunities; sons Jack (14) and George (12); and daughters Gabrielle (6) and Isabella (5). 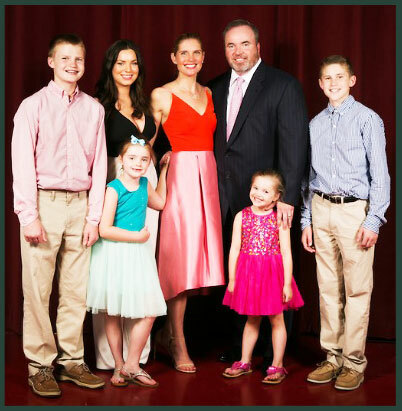 With five children in their family, Mike and Jessica McCarthy passionately support the American Family Children's Hospital. "I have a demanding job, but when you come home, it's a whole different world," McCarthy said the next morning. "The kids are just ... it's awesome. Watching the boys do so great in sports, and seeing the girls show so much creativity ... and when Alex is here, it's really complete. She has a tremendous relationship with all her siblings; it's pretty neat. Blended families, they're a challenge. You don't really know what you're getting into, and ours has just come together, and I couldn't be happier. You'd never know, unless someone told you." In his speech at the banquet hall, McCarthy said of George, "He changes his clothes four or five times a day." This is quite a contrast from his far-less-fashion-conscious big brother. "And then there's Jack -- I have to remind him to change his socks every day," Jessica said, laughing. Like many brothers who are near one another in age, Jack and George are close, competitive and sometimes combative. "We teach them, 'Fight hard, love harder,' " McCarthy said, laughing. "George, who's the younger one, doesn't back down. He tells me, 'If I can just withstand the first 30 seconds, I can get him.' That's how much they fight -- he has a game plan!" McCarthy understands the brotherly bond, though he faced fewer physical challenges back in the day. Because Joe McCarthy was four years younger than Mike, and less physically imposing, he was less motivated to scrap -- but he held his own in other areas. "He was younger, but he was easy," Mike recalled. "He was a really good athlete, so you took him everywhere as your little brother. He played in all the pickup games ... He always played up, from T-shirt league to little league and beyond. And he was so intelligent." A former state deputy attorney general, Joe had his own law practice and was an adjunct professor at CCAC Allegheny Campus. "He was a lawyer, and frankly, I think he was at the point of his life he was kinda bored with the law," Mike said. "He wanted to do bigger and better things. And those were things him and I talked about doing after I was done coaching. But when are you ever done?" hen McCarthy got the call informing him of his brother's sudden passing, he quickly headed home. "The minute I saw him, I knew something had happened," Jessica said. "It's just so hard. It shows you how important family is ... the support we have for each other." Five days later, at Joe's funeral, McCarthy was the last of four speakers to approach the podium and share his memories. "To be honest, I didn't know if he really should," Jessica said. "His brother was his hero. It was really hard on him. But he was amazing. He made us laugh. He made us smile. He did a beautiful job." Said Mike: "I did better than I thought I would ... it was emotional. It just numbs you. I just feel so bad for his wife and kids and my parents. Nature threw my parents a curveball. You're not supposed to bury your children." McCarthy was heartened by the outpouring of support he received, both from the larger NFL community (the Steelers sent a delegation to Joe McCarthy's service that included coach Mike Tomlin and general manager Kevin Colbert) and the Packers' organization. Bennett was one of numerous Packers employees to fly to Pittsburgh to attend the wake, and Rodgers -- while accepting his second MVP award at the NFL Honors event the night before Super Bowl XLIX -- nearly broke down when he spotted his coach in the crowd. 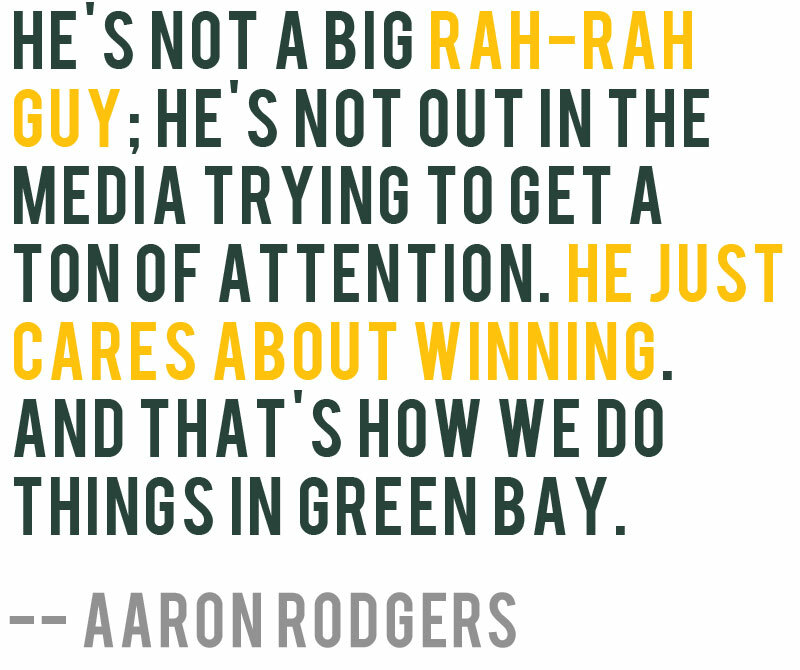 "I was in my speech for MVP and I saw him and I got choked up," Rodgers recalled. " 'Cause I have so much love for him and knew that he was going through some stuff, because of how close he and his brother were. That was hard. 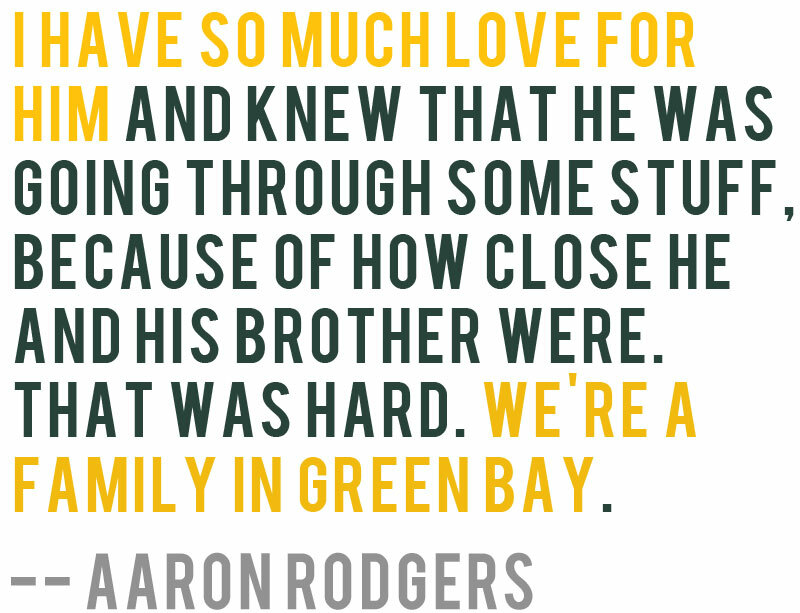 We're a family in Green Bay. A few years back, Joe Philbin lost a son, and the majority of us went to the funeral. I remember how difficult that was. It's tough to see a loved one go through that. And it was the same thing with Mike." McCarthy, like many grieving adults, threw himself back into his work, beginning with the decision to give up his play-calling duties and give Clements, Bennett and Van Pelt (among other assistants) increased responsibilities. It took him several months to resume any semblance of a normal sleeping routine. "You feel like you'll never catch up [on sleep]," he said. "This is the most change I've ever had at work. So the offseason, just from a pure work standpoint, this has been my biggest challenge." Family time, as always, has provided McCarthy -- described by his wife as "a big teddy bear ... a family man through and through" -- with the peace and perspective he needs to persevere. And his responsibilities as an uncle have become even more meaningful, and more cherished. In April, he and Joe's middle child, Michael, then a University of Kentucky freshman, attended the Final Four in Indianapolis. And Michael's older brother, Matt, who plays club baseball at Penn State, spent the summer pitching for the Green Bay Bullfrogs, a collegiate summer-league baseball team, and living at aunt and uncle's house. "We're so proud of him," Jessica said of Matt. "It's been so nice having him here this summer, though he's not home a lot -- they [had] 72 games in 74 days!" The Packers face the highest expectations entering this season, with plenty of Super Bowl chatter in Cheesehead country -- and beyond. Come autumn, Uncle Mike's games will once again be the focus, and the Packers, who've made the playoffs in each of the past six seasons and have won four consecutive NFC North crowns, once again figure to be in the postseason mix. McCarthy's rallying cry is to hit the ground running, given that the Packers have lost two of their first four games in each of the last three years. "We've gotta start the season better," he said. "That's really where I'm focused on. We've been a 2-2 football team the last three years -- and that's not cutting it." Sundays, at least early on, will be an adjustment. Said McCarthy: "Ron Zook tells me all the time, 'You're gonna really enjoy the games more, as a head coach ... because you'll see everything, and you'll be involved in everything ...' He says, 'Trust me, you'll have a lot more fun.' "
McCarthy will have to take Zook's word for it; calling plays, after all, was perhaps his favorite part of being a head coach, and he did not make the decision to give that up without considering the collateral damage. "I mean, it was a win for everybody," he said. "The one guy I was worried about was myself." Rodgers, too, believes the changes are "a good thing for everybody" -- and as he flashes ahead to the strategic conversations he and Clements will be having on game day, the quarterback fully expects McCarthy to suffer from a severe case of FOMO. "Well, he's definitely gonna be wanting to jump in," Rodgers said, laughing. A couple of minutes later, Rodgers took a deep breath and -- like everyone who knows McCarthy well -- became a bit choked up when talking about the loss the coach experienced last January, one that transcended the searing disappointment the Packers had experienced in Seattle three days earlier. "It's tough," Rodgers said softly. "But Mike's a fighter, and he'll get through it. He's got a great family around him. And sometimes stuff like this just galvanizes people." Michael Silver is a columnist for NFL Media. Follow him on Twitter @MikeSilver.